Combine the dried fruit and candied peel in a large bowl. Add the 4 tbsp brandy and stir in to mix well. Cover and leave overnight. Preheat the oven to 140°C/fan120°C/gas 1. Put the remaining ingredients except the almonds in a large bowl. Beat with a hand-held electric mixer until well combined. Stir in the nuts and the soaked fruit with any soaking liquid. Grease a deep 23cm round tin or 20cm square cake tin with butter, line with a double layer of baking paper and grease the paper (see Golden Rules). Spoon the mixture into the prepared tin. Level the top and cover with a disc of baking paper. Bake for 4-5 hours until firm to the touch and a skewer pushed into the middle comes out clean. Leave the cake to cool in the tin. When the cake has cooled, remove the baking paper disc, pierce the top in several places with a skewer, then pour over a little brandy. Remove the cake from the tin but keep it in the baking paper. Wrap with more baking paper, then wrap with foil. Store in a cool place for up to 3 months to mature, occasionally unwrapping and spooning over 1-2 tbsp brandy. Decorate the cake with glacé fruit, marzipan or ready-to-use icing. Tie a ribbon around the cake if you like before serving. Soak the fruit overnight so it can absorb the alcohol and plump up. If you’re short on time, warm everything briefly in a microwave so the fruit will absorb the alcohol more quickly. Let the fruit cool completely before making the cake. If you prefer, you can feed the cake with spiced rum, sloe gin, whisky, sherry or madeira. Double-line the cake tin with well-buttered baking paper to stop the outside of the cake from drying out during the long cooking time. Put a circle or square of greased baking paper on top of the cake to prevent the upper surface from browning too much. Our friends at Majestic Wine recommend Palmer Colheita 2006. 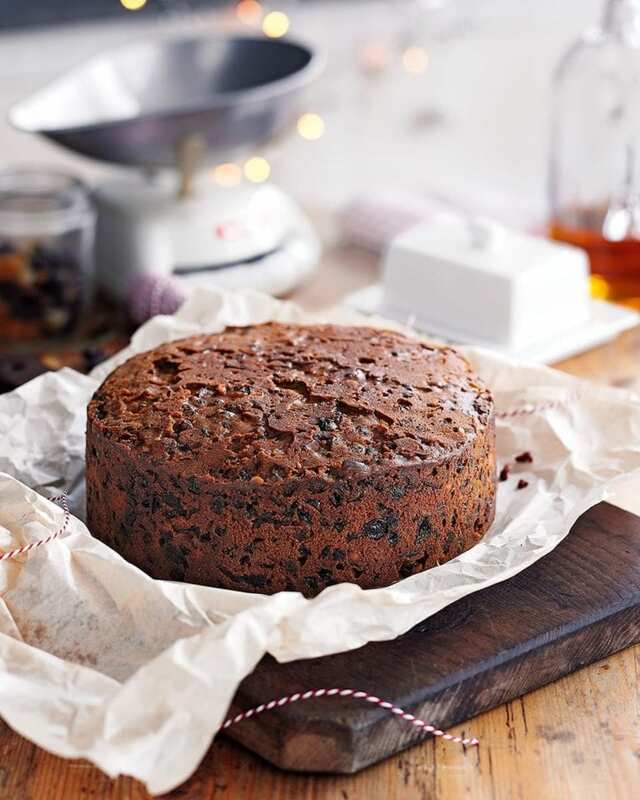 A Christmas cake’s decadently fruity flavour demands a wine with plenty of ‘oomph’. Port is your best bet, and the Palmers’ candied prune and toffee notes will make a perfect ending to any Christmas meal.